Rescue Rudy was developed for lifelike adult or juvenile victim handling, transportation, and extrication training. 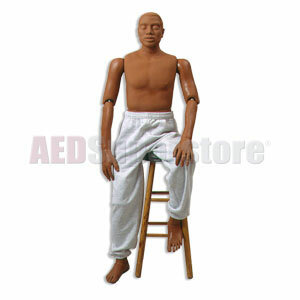 These 5' 5" manikins can be safely used in situations too hazardous or uncomfortable for human volunteers. Made of durable vinyl with 4,100 lb. test plastic-coated cables. Used by the U.S. Military, Fire, and Police Departments, Safety Teams, and Emergency Personnel for rescue and extrication from pole top, confined spaces, collapsed buildings, smoke rooms, and ladder carry-down protocols worldwide. Weight distribution according to human weight distribution chart. Size: 50" x 21" x 12"
Important Notes: The Rescue Rudy manikins have a hook that is used during the manufacturing process. Under no circumstances should this hook be used to suspend the manikin. If the manikin needs to be suspended for a training exercise, please use a harness, or other type device. DO NOT immerse Rescue Randy manikins in water. 3-year manufacturer's warranty covers materials and workmanship only.